Rutherford One Insurance Services is now a CARFAX authorized representative and now offers special pricing for a Full History CARFAX Report. Providing this service is just another layer of protection we can provide to our clients when making a decision to purchase a motor vehicle. Contact us for more details. Now partnering with Hagerty "The Classic and Collector Car insurance Specialist"
provides complete coverage for your home, business and auto insurance requirements. We have insurance for any situation, and can provide what you need at the best value. As an Independent Agent, we are not obligated to one insurance company. Therefore, we are able to represent our client's best interest, not the insurance company's. Please give us a call to learn how we can assist you with these coverages. We provide homeower's insurance, renters insurance, and auto insurance for all of Northern California, including Sacramento County, Placer County, Nevada County and El Dorado County. Some of the communities we serve are Sacramento, Fair Oaks, Granite Bay, Roseville, Woodland, Davis, El Dorado Hills, and Folsom as well as Central and Southern California. Rutherford One Insurance Services is unique, offering a broad range of products to cover most insurance needs. We are totally independent and represent a wide and diverse range of Insurance Companies. This means that we listen to you and aggressively seek out insurance solutions explicitly for your needs. We customize the insurance for your situation. In many cases, we can save you money while providing better coverage than you have today. We are experts at understanding your requirements! 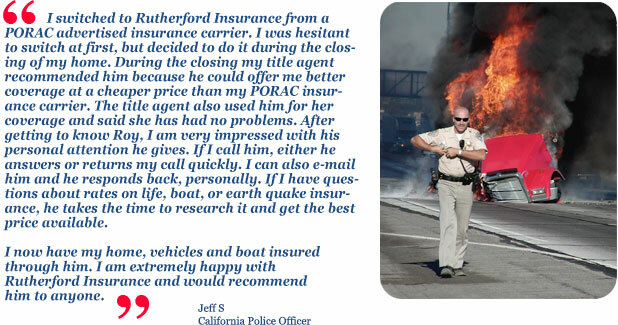 Rutherford One Insurance Services has an interest in helping your clients! We will shop several companies for the lowest rate and best value. We pride ourselves in representing only insurance companies that are financially strong and committed to service.